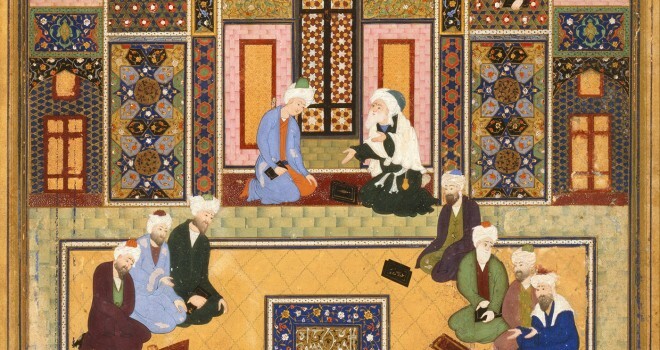 In the Muslim tradition, the questions around occasionalism and causality arose in the early days of the Muslim Golden Age of Science when scholars like Ibn Sina and Ibn Rushd began using the philosophical work of Aristotle and other Greek philosophers and making them accessible to Muslims. A showdown with the theologians followed. Imam Al-Ghazali is a central figure in this and his detailed writings on philosophy and attacks on Muslim philosophers remain very influential, despite the more rationalist Ibn Rushd (Averroes)’s point-by-point rebuttal in what was one of the great debates of Islamic intellectual history. Ash’arism – Al-Ghazali’s theological school was explicit in its rejection of causality and adoption of occasionalism, and this is seen by many as having contributed to the decline of Islamic science by eroding its intellectual foundations. Al-Ghazali, at least in his writings aimed at the masses, seemed to deny causality, in conformity with the normative Ash’ari school. However, there were many leading Ash’aris after Al-Ghazali, such as Al-Razi, Al-Amidi and others, some of whom endorsed belief in secondary causality, i.e. that God did create causal effects in created things. And there were vigorous discussions on these matters amongst the Ash’aris, Maturidis and Mu’tazilis. The Task Force’s discussion  on causality was based additionally on the Shaykh Afifi A-Akiti’s new research whose central thesis is that Al-Ghazali was secretly more rationalist than he appeared in his texts aimed at the masses, and that his method enabled the rational and natural sciences, seen as heretical in his time, to be accepted into the mainstream of Islamic scholarship and discourse in later centuries. Akiti’s paper was based on his study of Ghazali’s recently-discovered work, al-Madnun bihi ‘ala ghayri ahlihi (“That which is restricted from those unfit for it”). Akiti refers to “The good, the bad and the ugly” of Ghazali’s conception of rational or philosophical knowledge, denoting respectively the knowledge he set out in his Madnun, Tahafut al-Falasifah (Incoherence of the Philosophers) and Maqasid al-Falasifah (Objectives of the Philosophers). In the latter, he had reproduced Ibn Sina’s Hikayah. Afifi Al-Akiti refers to Al-Ghazali as Sunni, orthodox, Ash’ari, Sufi, Aristotelian and rationalist and claims that although he single-handedly managed to get rational and natural sciences admitted by the backdoor into theological scholarship, some of his contemporaries and successors saw through this. For instance, his “appropriation” (talwih) of Greek rational sciences was condemned by Ibn Taymiyyah as “deception” (talbis), but described by Sabra as “naturalisation” (tatbi’). Nevertheless, claims Al-Akiti, Al-Ghazali was so effective that within a century of his passing Muslim theological schools and madrassas were churning out major influential works in rational and natural sciences. There was much discussion amongst the Task Force members about Ghazali’s views on causality, among other things, and his alleged role in degrading the support for science at the height of the Muslim Golden Age of Science. The members expressed concerns about Al-Ghazali’s dissemination of knowledge and his views according to three levels of his audience: the elite, the scholars and the masses as to whether he was right to restrict promotion of the rational sciences, which he had sometimes seemingly attacked in other works written for the masses, to the elite, or whether he had a duty to be more transparent and consistent. It was noted that Ghazali clearly said different things in different books and at different times, and his authorship of various works is sometimes disputed. For example, his Jawahir al-Qur’an (Substances of the Qur’an), in which he again addresses some of these controversial topics, is one of his last works, and there is also his Qawa’id al-‘Aqa’id (Principles of Creeds). Montgomery Watt severely doubted whether the Mishkat al-Anwar was by Ghazali, especially the last chapter. Other topics relevant to the Task Force that had been addressed by Al-Ghazali were his assessment of the validity of philosophical proofs of God, and his view on causality: Ibn Rushd said in his reply to Ghazali, Tahafut al-Tahafut (The Incoherence of the Incoherence), that Al-Ghazali had used a causal argument to refute causal effects: in short, he had “used causality to deny causality!” The hadith scholar Ibn al-Salah also attacked Al-Ghazali in this regard. Frank argues that Al-Ghazali used atomistic language but ultimately argued against atomism. Griffel , in his discussion of the 17th chapter of the Tahafut, argued that Al-Ghazali denied deterministic causality, i.e. that things had intrinsic causal powers. With regard to the emphatic denial of causality and takfir (judgment of heresy or blasphemy) of naturalism found there, Task Force Members suggested that this is disputed within the Ash’ari school, with many Ash’ari theologians endorsing God acting through secondary causality. And Al-Ghazali seems to have endorsed secondary causality in the Madnun. Skepticism and the challenges of re-writing and re-interpreting centuries of scholarship and its harm aside, Al-Ghazali’s influence and legacy in the Islamic world, both Sunni and Shia, is so immense and that the Task Force members agreed that discussion of some of these issues is crucial to the “Islam and Science” conversation, although some members questioned how relevant pre-modern theology was to the advancement of modern science in contemporary Muslim-majority societies. The next steps should be “integration” of the rational and natural sciences into Islamic worldviews.